Sally Ride Science has joined the University of California, San Diego. In a new agreement the STEM education company created by America's first female astronaut has become an official part of the institution under a new multidisciplinary program that intends to continue its educational mission of inspiring K-12 students in science, technology, engineering and math, with a special emphasis on reaching out to girls and other under-represented groups of kids. Sally Ride Science at UC San Diego, as it's being called, will offer professional development to teachers; deliver K-12 STEM + Arts (STEAM) courses, lectures and events; and provide online programming via UCTV, a television station with programming from the University of California system. The program will be implemented through collaboration among three divisions: the university's Extension, San Diego Supercomputer Center and Scripps Institution of Oceanography. Two co-founders of Sally Ride Science will continue with the new program. "Sally Ride was recognized throughout the world as a physicist, astronaut, professor and science education advocate," said Chancellor Pradeep Khosla in a prepared statement. "We are honored to carry on her dream of Sally Ride Science to inspire future generations of students to get excited about STEM fields." Ride was working on her doctorate in physics at Stanford in 1977 when she saw an article in the student newspaper saying that NASA was looking for astronauts — and that women were encouraged to apply. Ride was among the first six women chosen to join the astronaut corps. She was also aboard the space shuttle U.S.S. Challenger when it launched from Kennedy Space Center, FL, June 18, 1983 as the first American woman to go into space. A year later she flew a second time. After retiring from NASA, she joined UC San Diego's faculty as a professor of physics. She cofounded Sally Ride Science in 2001 and served as CEO of the company until her death from pancreatic cancer in 2012 at age 61. Ride's partner in life and business, Tam O'Shaughnessy, previously co-founder and CEO of Sally Ride Science, will serve as the executive director of the new organization. Also moving into the new organization will be Karen Flammer. Flammer, a UC San Diego research physicist who is also a co-founder of Sally Ride Science, will serve as director of education. Earlier this week she was named director of education at the Super Computer Center. 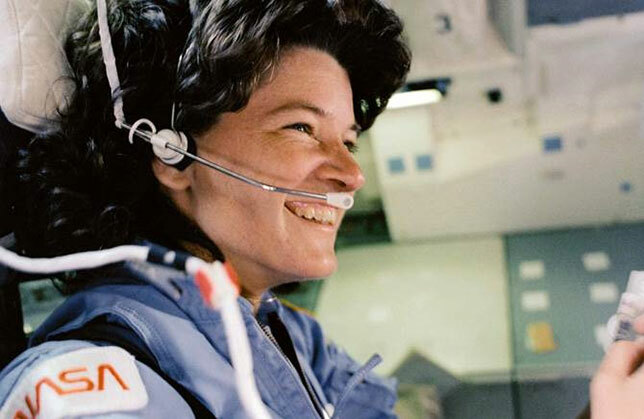 UC San Diego's Extension program will develop a Sally Ride series on UCTV's STEAM channel and do outreach to teachers, girls, at-risk youth and first-generation students. In a stroke of good timing, the Scripps Institution, which is also part of UC San Diego, will shortly take delivery of a new oceanographic research vessel: R/V Sally Ride. Under construction now by the U.S. Navy, the ship was christened Sally Ride in 2014 in honor of the scientist's long career in space exploration and science education. Once that vessel is launched, students and teachers will be able to perform ocean exploration using satellite telepresence while interacting with scientists at sea. This endeavor is similar to one set up by Flammer, who created the Sally Ride EarthKAM, a NASA program that allows middle-schoolers to capture images of Earth using a camera on the International Space Station and have them posted on the Internet for public viewing.